I've been following Minnesota based Skye Klad's development since hearing their Extreme Vacuum Person CDEP in 1998. The band has occupied a luscious cosmic realm between classic Space and Krautrock and the more modern guitar heavy style of Spacemen 3 and the like. Founding guitarist Jason Kesselring is an inventive musician and when Salamander guitarist Erik Wivinus was brought into the fold for last year's self titled CD it was a pairing made in space heaven. My excitement over receiving the latest Skye Klad CD was initially tempered by the promo sheet description of taking "a break from their trademark extended space jams to delve into the realm of pop", though I took comfort in the next line which goes on to explain that it's still "all classic Skye Klad: richly psychedelic, masterfully executed, and dark as the depths as interstellar space". All true... sure, the longest track is only 5:56 and the second longest track a full minute less. But as much of a sucker as I am for lengthy stretch out jams, I can also appreciate a concise statement that rewards my attention with challenging and inventive music. And besides... Skye Klad's notion of "pop" is only so relative to the extended jams they've set aside for now. And this album ROCKS waaaaaaay too hard and is much too dark in atmosphere to be considered pop. There are a total of 17 songs on the CD so I'll just run through some of the highlights. "Reign Song" opens the set with crushing psychedeli-metallic guitars and our introduction to Kesselring's capable vocals, having taken over from long time singer Adam Backstrom. Monstrous thudding power chords are accompanied by the killer Chrome-like acid lines that I've grown to love from Skye Klad. "Sunwheel" features similar guitars but with more focus on the song. This is likely what the band means by "pop", though I'll call it power-psychedelia with a smooth Stoner underbelly. Oh, and the jams are there. Just not extended. Much of the album is in this style, though there's still plenty of variety, including the band's trademark brand of dual power guitar psychedelia. "Outrider" is a standout tune consisting of similar metallic psych rock but with traces of old time Pink Floyd guitars swirling in the mix. "To The New Dawn" falls into the experimental realm. Nothing pop about it. "Meechmit" is a short tune with classical patterns on acoustic guitar along with whining Frippoid electric guitar licks. "Evening Star" has a bit of a Black Sun Ensemble sound. "Lightbringer" is as powerful as anything on the album, but if the band chose to go the video route this would be the song to do it with. "As It Is So Be It" is a quirky, almost dancey, song with a 60's pop-psych feel. And "Blue Skies" also has a 60's sound though it's all within a pounding metallic wall of sound. In summary, Skye Klad have produced another killer release that will satisfy their long time fans as well as garnering some new ones along the way. Actually the biggest change in the band's sound is Kesselring's vocals, which have a dark and even slightly doomy quality. This is definitely Skye Klad's darkest music to date, though it all occurs within a gorgeously psychedelic stew. A late entry to my best of 2002 list for sure. For more information you visit the Skye Klad web site at: http://www.skyeklad.com. 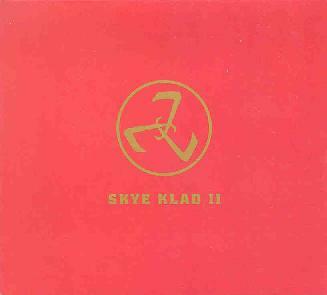 Skye Klad II is distributed by Mutant Music. You can visit their web site at: http://www.mutantmusic.com. Contact via snail mail c/o Mutant Music; 1705 Hague Ave; Suite 4; Saint Paul, MN 55104.